I learned there are many different ways to make a blueberry pancake. I have collected recipes that include ingredients like sour cream, corn meal, buttermilk, lemon peel and, of course, blueberries. Whatever the ingredients, I'm sure you will find a recipe your family will enjoy. 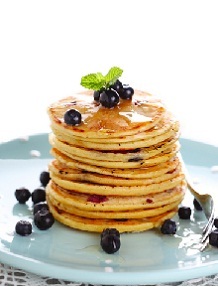 I have also included a few blueberry syrup recipes to dress up the standard pancake. Fun Facts: A pancake is typically a thin, flat cake, made of batter and baked on a griddle or fried in a pan, the pancake has a very long history and featured in cookbooks as far back as 1439. German and French pancakes, leavened by eggs and a lot of beating, are baked very thin and served with sweet fillings. The French pancake, the crêpe, is thin and crispy and filled with delicious sweet fillings.